Two weeks after the April 20 explosion at the Deepwater Horizon rig in the Gulf of Mexico, an oil slick lingered not far from the Mississippi Delta. 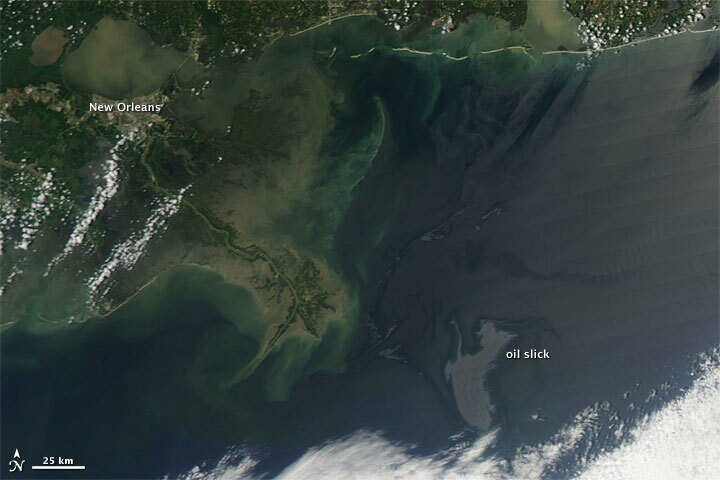 On May 4, 2010, the Moderate Resolution Imaging Spectroradiometer (MODIS) on NASA’s Aqua satellite captured this natural-color image of the oil slick. The slick appears as an uneven gray shape immediately north of a bank of clouds. Sunlight bouncing off the ocean surface gives the oil slick a mirror-like reflection easily detected by satellite sensors. The Pentagon approved the deployment of as many as 17,500 National Guard soldiers to assist with cleanup efforts, according to the Associated Press. Meanwhile, well operators considered drilling a relief well—a diagonal well intersecting the original that could be filled with mud or concrete to block the flowing oil. NASA image by Jeff Schmaltz, MODIS Rapid Response Team at NASA GSFC. The MODIS Rapid Response team provides daily images of this area. Caption by Michon Scott. 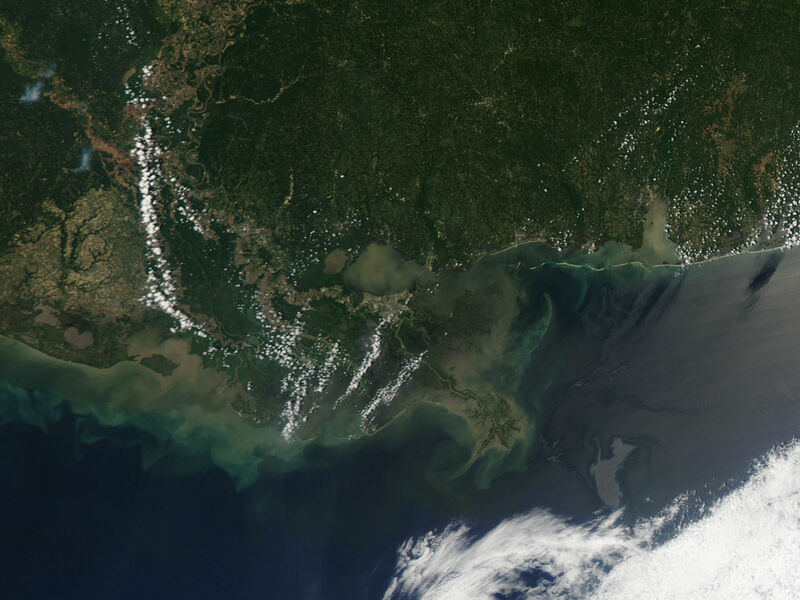 Acquired May 4, 2010, this natural-color image shows the oil slick from the Deepwater Horizon accident lingering off the Mississippi Delta. Associated Press. (2010, May 4). Pentagon approves up to 17,500 National Guard soldiers for Gulf oil spill. The Times-Picayune. Accessed May 4, 2010. Beneath the oil slick. The Times-Picayune. Accessed May 4, 2010. Bradsher, K. (2010, May 2). Relief well was used to halt Australian spill. the new York Times. Accessed May 4, 2010. Mascarelli, A. (2010, May 4). Ecologists brace for oil spill damage. NatureNews. Accessed May 4, 2010.